When I travel, I try to take it easy on my last full day in a new city. So on our seventh day in Toronto, Nishan and I enjoyed a lazy morning before heading over to Khao San Road for a Thai lunch. Named after a street in central Bangkok where the chef grew up, Toronto’s Khao San Road is in the middle of the city’s entertainment district and exudes a hip, laidback vibe. 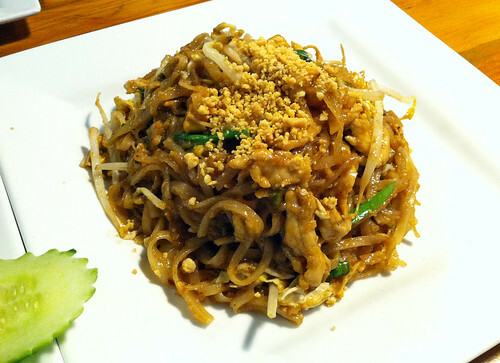 We started with the Bangkok-style pad thai. Flavored with tamarind, shallots, chives, fish sauce, peanuts, and lime, this was easily some of the best pad thai I’ve ever tasted. We also had a plate of the pra grad prao. 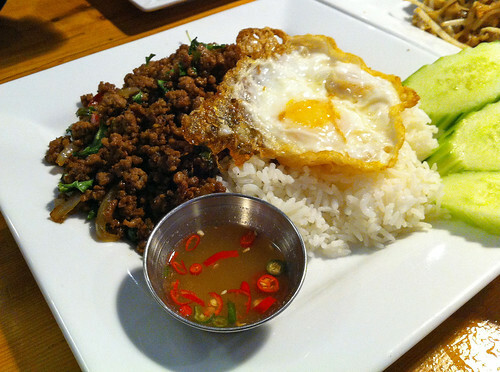 I usually cook this dish with chicken, but here, we ordered it with beef and topped with with a fried egg. A wonderful choice. After all, everything tastes better drizzled with runny yolk, especially when it’s combined with chili, garlic, and basil. Afterwards we took the metro to the Royal Ontario Museum where we checked out their special exhibit on Mesopotamia. My favorite thing about the museum, though, was the building itself. 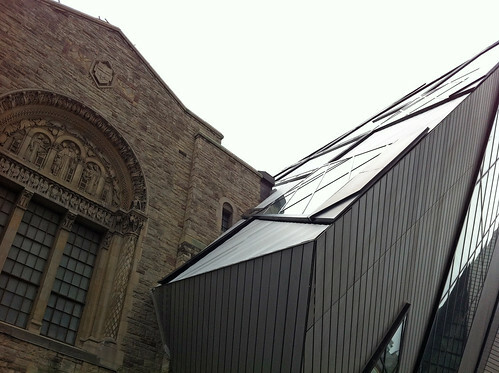 Originally built in 1912 in a Neo-Romanesque style, the museum added a deconstructivist crystalline-form in 2007 made of glass and aluminium sitting on top of a steel frame. The crystal’s walls do not touch the sides of the heritage buildings. 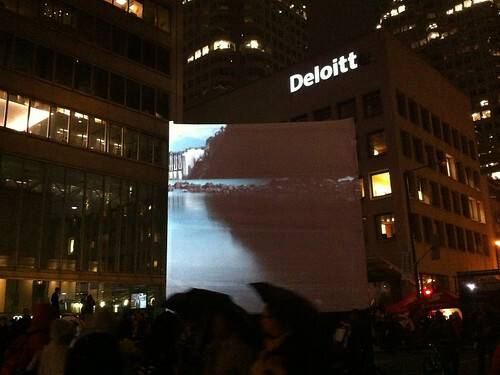 Later that evening, we were lucky to catch Nuit Blanche, an annual all-night or night-time arts festival. Toronto’s Nuit Blanche included private and public art galleries open all night long, with the center of the city itself being turned into a de facto art gallery, art installation, and performance space. The evening even included a special installation of Ai Weiwei’s Forever Bicycles. 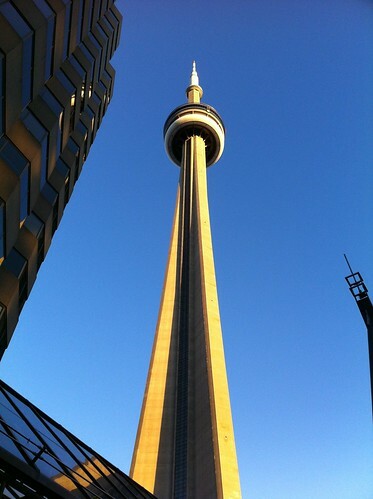 Whether or not we realize it in the states, Toronto is a world-class city. There’s just so much brewing beneath the surface. We woke up on our sixth morning to a rainy and cool Toronto. I can’t think of anything better than ramen to eat on a drizzly day, so Nishan and I made our way to the downtown core to Santouka Ramen. Based in Japan but with outposts all over the world, Santouka specializes in Hokkaido-style tonkotsu broth and chewy, perfectly cooked noodles. I got a bowl of the shoyu ramen and a salmon roe rice bowl. Nishan got the shio ramen and you know what? Both were incredible, but the shio was better. 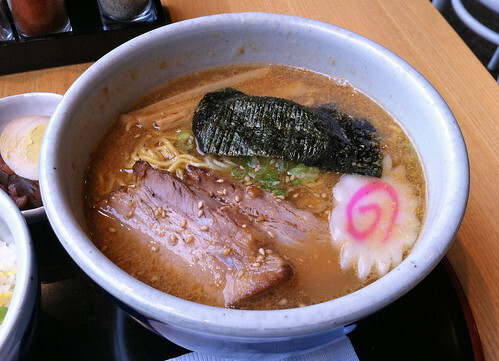 Who knew the humbly-named salt ramen could taste so perfect? 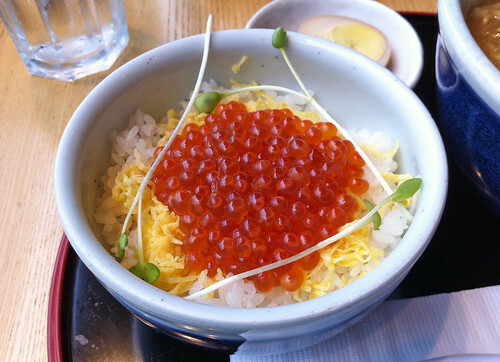 My rice bowl was wonderful, too: fluffy dashi-infused rice topped with thin shreds of egg and salty orbs of roe. Once we were fortified, we took a walk along nearby Yonge Street, one of the longest streets in the world and also Toronto’s main street and major shopping district. We popped in Eaton Centre too, if only to admire what the US has yet to achieve: classy, pretty malls. It didn’t even really feel like a mall, except for the ginormous flagship Hudson’s Bay department store. I can’t believe I have fuzzy warm feelings towards a mall. All that mall-ing can make a person hungry (again), so we ended our day with an order of Montreal smoked meat poutine from Smoke’s and a gin rickey from the Library Bar at the Fairmont Hotel. It may not have been the healthiest end to our day, but it sure was a delicious one. If you told me that the dim sum in Toronto is better than San Francisco’s, I wouldn’t have believed you unless I tried it for myself. And that’s exactly what I did and it turns out Toronto wins (insert Drake joke here). Nishan and I headed over to Lai Wah Heen for a decadent dim sum brunch on our fifth day in the city and even though it’s been nine months since we visited, I can’t get these luxurious morsels out of my head. 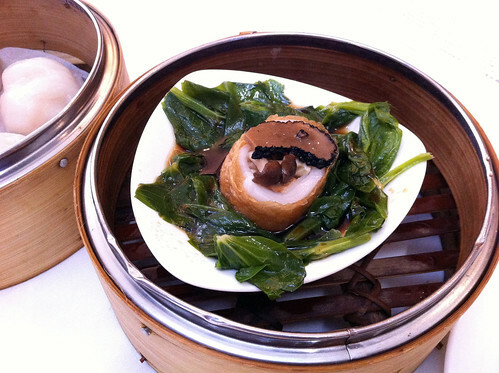 We started with a soft bean curd sheet dim sum with mushrooms and truffle. This was perfect but amazingly the broth was the best thing about this dish. I want to drink this truffle-laden broth for breakfast every morning. And lunch. And dinner. We also had the beef mousse and mandarin peel rice roll. Ethereal, savory, and ever-so-slightly citrusy. Delicious. 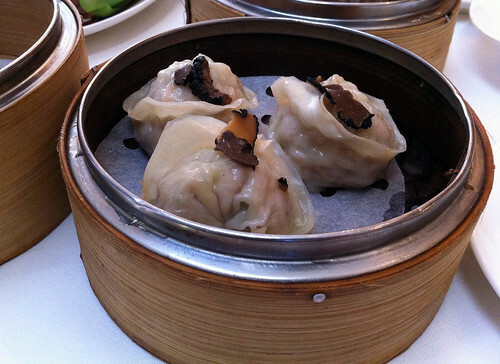 Next we had the minced chicken and truffle dumplings. My only regret is that this didn’t taste more like truffles. 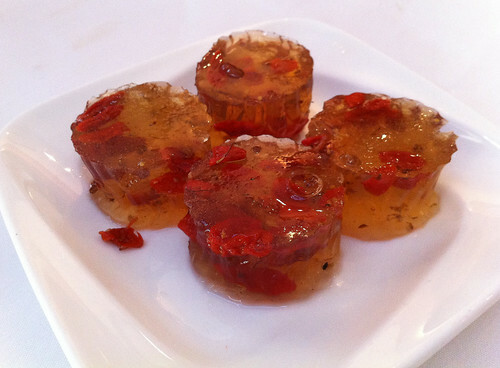 We finished our meal with a plate of crystal jelly with wolfberries. 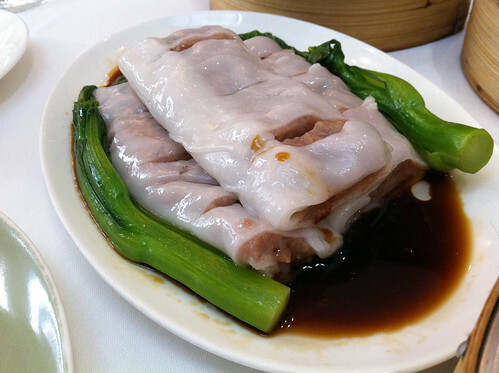 I love these types of textures and the cool, clean flavor was a perfect ending to our dim sum. Oh, Lai Wah Heen. I can’t wait until we meet again. After brunch we took a break and headed over to St. Lawrence Market, one of the best food markets in North America and also where I tried my first pecan butter tart. 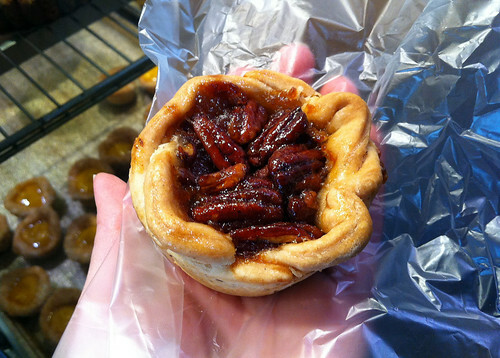 Butter tarts are quintessentially Canadian and this one was like pecan pie. Except more butter. Mmm, buttery pecan pie. 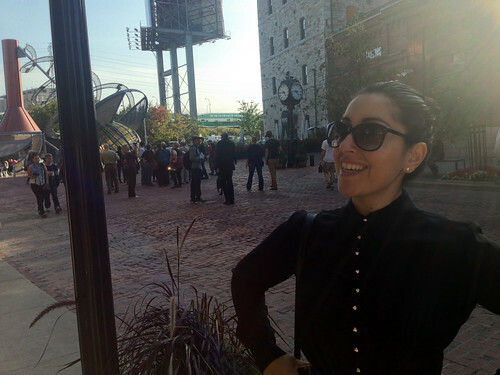 Next up was the historical Distillery District, where we walked off all that dim sum and pastry. 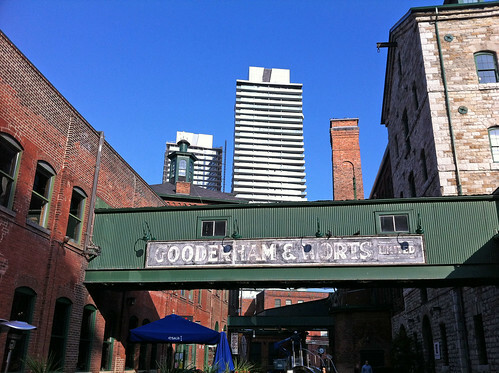 The district is the site of the former Gooderham and Worts Distillery and is the largest collection of Victorian-era industrial architecture in North America. These days, it houses loads of trendy cafes and fashionable shops selling local wares. For dinner, we headed back towards the downtown core for reservations at Momofuku. David Chang opened up a multi-restaurant building in Toronto a couple of years ago and the hyper-industrial glass building is hard to miss. 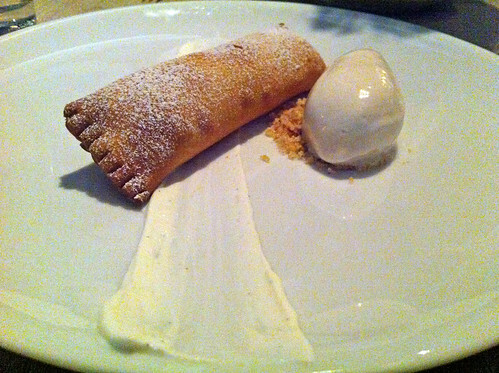 Inside, we had a distinctly Momofuku experience: falafel buns, brussels sprouts with fish sauce and puffed rice, corn with nori butter, hangar steak with kimchi, and the most Momofuku finish of them all: fried apple pie. Momofuku pulled off being playful without playing around, if that makes sense. Next time I’m picking up a few compost cookies to take home. Toronto is huge. San Francisco feels like a small town in comparison and the first thing that struck me as we checked in to our hotel in downtown Toronto is how expansive the city limits are. 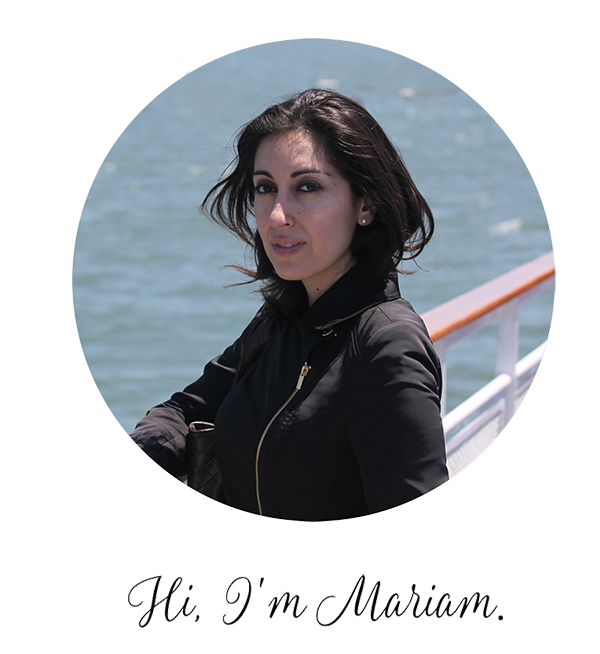 Canada may be sparsely populated, but its cities are huge and there are a (metric) ton of things to do, see, and eat. 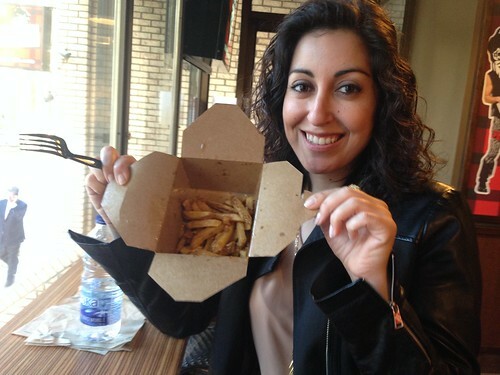 Naturally, my first order of business was poutine. Must. Eat. All. The. 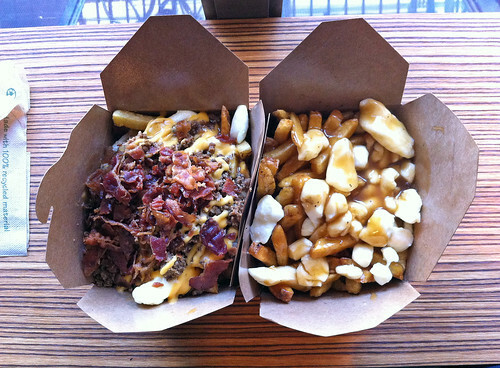 Poutine. Word on the streets (and by streets, I mean the internet) is that Smoke’s Poutinerie is one of the best, so Nishan and I stopped by for a pre-dinner snack. Yeah, “snack.” I got the classic, Nishan got the double bacon cheeseburger. In the wise words of the great George Takei, oh my. What is this magnificence? What is this perfection? And why don’t we have it south of the border? Afterwards we walked over to CN Tower. CN Tower was the world’s tallest tower until the completion of the Burj Khalifa in 2010, and I learned that CN stands for Canadian National, the railway company that built the tower. Inside, we took the glass shaft elevator up to the observation tower, complete with glass floors! Only one of us was amused. For dinner (or dinner #2 depending on how you look at it), we ate at Buca, a trendy Italian restaurant in a converted old brick warehouse. 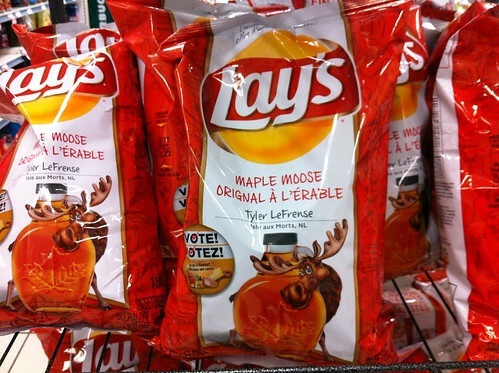 And of course we had an after dinner snack, because Canada. 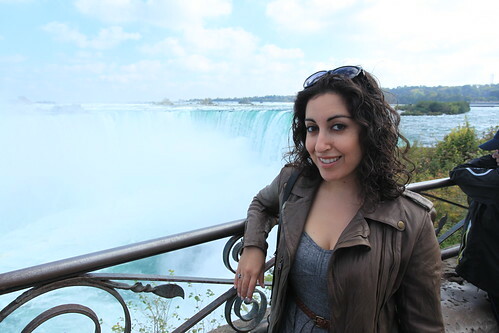 By our third day in the Toronto area, we’d settled in London, Ontario, where we spent a few fun days with Nishan’s brother, sister-in-law, and adorable nephew. 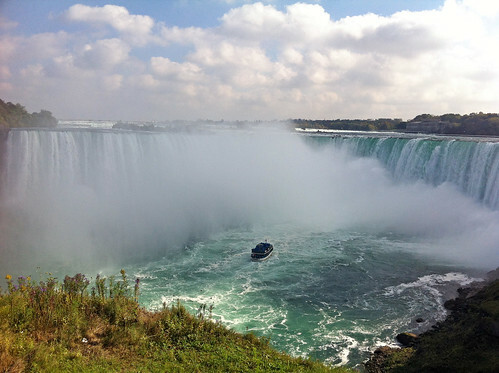 London was also our home base for a day trip to Niagara Falls, only a two-hour drive away through Niagara wine country. The drive was pretty and the reward was stunning. It’s not every day you get a view like this. 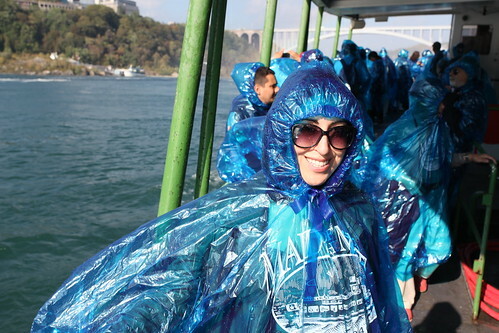 We decided to embrace Niagara Fall’s touristy-ness and embarked upon the Maid of the Mist, a boat ride that takes you all the way up to the waterfalls. I thought these plastic overcoats served no purpose other than to make passengers look ridiculous until I realized how misty it really gets down there. We were soaked! Once we dried up we began our drive back to London, souvenirs in tow. 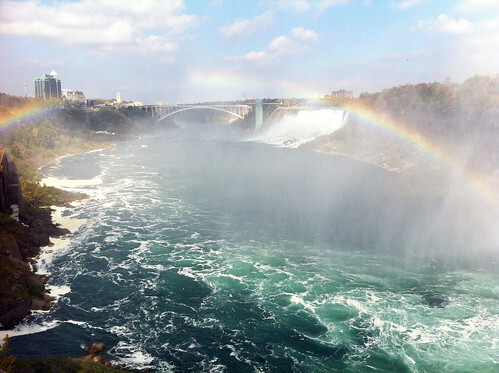 Niagara Falls may be touristy, but it’s worth the drive.